I love supporting local companies and it is incredibly easy to do so with Boulder-based Chocolove. 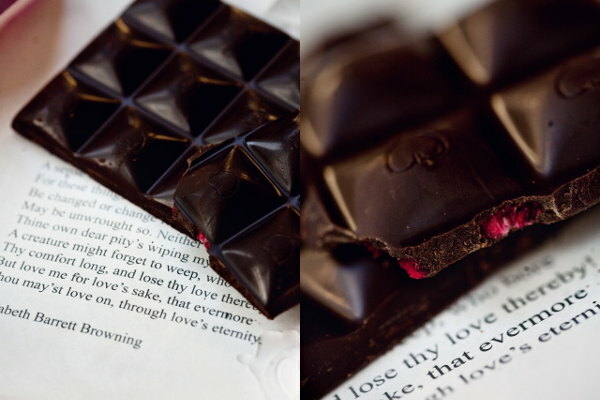 The package design resembles a love letter sent from a distant land, and inside each wrapper - a classic romantic poem. The cocoa content is clearly indicated on the front of each wrapper and the tasting notes simple and approachable. Many of the 18 flavors are vegan. Katelyn holds a Bachelor of Science in Health, with a focus on Community Health. She currently lives in rural, Southwestern Colorado with 3 humans, 4 sheep, 5 cats, 2 chickens and a dog. She spends her days entertaining a wee vegan baby, changing cloth diapers and making magic happen in the kitchen. Visit Katelyn's blog.